April 1, 2018 at 11:53p.m. Dee Gordon isn’t known for hitting home runs, and before this year he’d never played the outfield. But on Sunday, his power and his glove in center field led the Seattle Mariners to a 5-4 win against the Cleveland Indians. Gordon, who has never hit more than four homers in a season, led off the seventh inning with a tiebreaking shot to right off Dan Otero (0-1). Gordon clearly knew he’d hit it well — after making contact, he watched the ball and walked out of the batter’s box. “It was a 2-2 game in the bottom of the seventh inning and it put us ahead, so I was excited,” he said. After he rounded the bases, Gordon leapt high for a celebratory high-five with teammate Jean Segura in the on-deck circle. 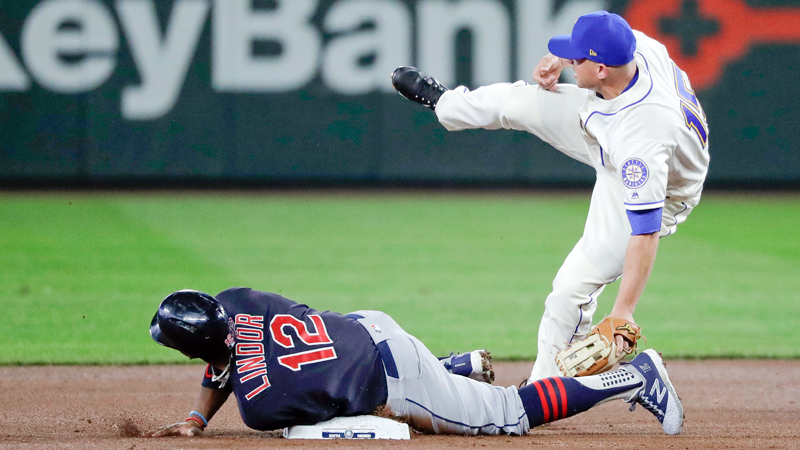 Gordon, an All-Star second baseman before the Mariners acquired him from Miami last offseason and moved him to center field, also made a sliding catch in the third after racing to deep left-center on a drive by Jason Kipnis. Along with Gordon’s big contributions, Mitch Haniger homered and Mike Leake pitched seven strong innings for Seattle. Leake (1-0) gave up two runs and five hits. He has allowed three runs or fewer in all six starts since joining the Mariners late last season. Gordon’s homer broke a 2-all tie and, a few batters later, Haniger added a two-run drive off reliever Tyler Olson to give Seattle a 5-2 lead. They were the first runs Olson has allowed with Cleveland — last year he threw 20 scoreless innings in 30 appearances for the Indians. Encarnacion cut the lead to one with his second homer in the eighth, a two-run shot. Edwin Diaz struck out all three batters in the ninth for his second save. Cleveland starter Trevor Bauer allowed two runs and five hits in five innings, striking out seven and walking three. Indians: Cleveland begins a three-game series at the Los Angeles Angels on Monday. RHP Mike Clevinger will make his first start of the season. Clevinger is 2-0 with a 3.94 ERA in four career starts against the Angels. Mariners: LHP Marco Gonzales opens a two-game series at San Francisco on Tuesday. April 27, 2018 12:07 a.m.